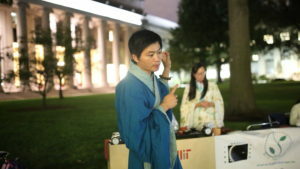 At the world-renowned Massachusetts Institute of Technology and Charles River (Cha/ Tea River as is called by Dr. 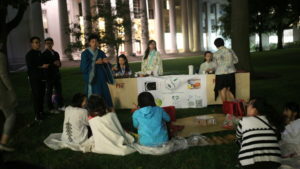 Tea), the WTeaO Mylovetea Midautum Festival with Gu-Qin, tea ceremony, poetry reading and singing, mooncake enjoying and puzzle guessing etc is successfully held by WTeaO.org, North American Chinese Tea Association (NACTeaA) and Mylovetea.com Dr. Tea, bringing the very romantic oriental culture to the world culture center of Boston. Thanks to the leadership of Dr. Tea over North America Chinese Tea Association and mylovetea.com team which have done the tea demonstration for US President Bush`s family, the tea prepared for the WTeaO Mylovetea Midautum Festival is also very unique and interesting, Lapsang Souchong (father of world black tea), World Expo Gold Medal Winning Phoenix Oolong Tea, the pristine moonlight white tea, mysterious “royal tea”, as well as many other tea products like the Dian Hong Tea and the similar tea that President Xi Jinping and President Obama drink together at G20 gathering. This event has been partially sponsored by China’s domestic tea companies like Phoenix Dian Hong Tea and Lapsang Xiaoxiang Black Tea of Hunan for their support and sponsorship, which had gain people’s wide acclaims. 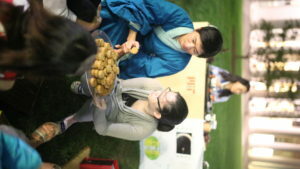 Moon cakes, in addition to those extensive materials like wu-ren, sesame seeds, green beans and other traditional moon cakes, a special taste of green tea moon cake is provided with a combination of the romantic moonlight and the natural freshness of green tea. Dr. 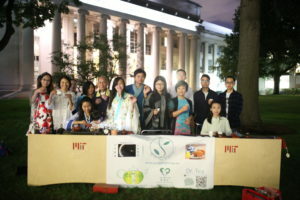 Tea (Xingcai Zhang) also introduced the world tea organization (wteao.org) and share the experience of doing the tea demonstration for the US president`s family! World Tea Organization (WTeaO.org) is a world-wide platform that units and serves world tea associations, producers, merchandisers & tea lovers, and promotes the Tea Science, Tea Health, Tea Art and Tea Culture of “Healthy, Harmony, Pure, Nature” all over the world. Also, we apply tea as a platform for culture, art, science and technology development, for innovators, entrepreneurs and investors. We are connecting the world of tea and the world with tea. Prof. Mildred Dresselhaus is the Advisory Board President of World Tea Organization. She is MIT Institute Professor who had won numerous awards including the Presidential Medal of Freedom from President Obama, the National Science Medal from President Bush etc. She has served as president of the American Physical Society, the first female president of the American Association for the Advancement of Science, and treasurer of the National Academy of Sciences. She was also the Chief editor of Science magazine. She also got the UNESCO Awards for Women in Science, 2007, considered to be the one the five most outstanding female scientist all over the world. Dr. Tea (Xingcai Zhang) is President of the World Tea Organization. World Tea Organization just send greetings to Mr. Tianfu Zhang for his 107 birthday, and awards him with Lifetime Achievement Award and issued letter of appointment to him as senior advisor. In addition to tea, this Mid-Autumn Festival Gathering has a special arrangement for the Chinese Guqin, the oldest musical instruments with most cultural charm and depth. The performance sounds clean and subtle and to a distance, “Autumn Song” brings the mind with the wind to the moon, goes straight and deep into the heart. It even provokes Dr. Tea for new poetry making. 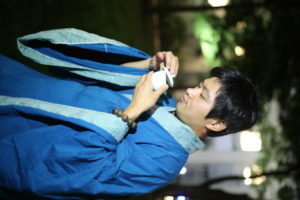 Even more interesting activies includes the tea ceremony with tradition costumes and new creations by Dr. Tea. Dr. Tea brings the ceremony and ec team including those from Harvard, MIT, Bentley, Brandeis etc, Hua, Elaine, Shirley, Vito, Ricky who dressed in the traditional North America Chinese Tea Associtaion (NACTeaA) and mylovetea.com traditional costume of” Green Mountain, Blue Lake”, showing the beautiful and generous show fusion of traditional Chinese costume and the charm and essence of World Tea Organization(WTeaO.org), North American Chinese Tea Association (NACTeaA) and mylovetea.com culture of” healthy harmony pure & nature “,which received wide acclaim. Those wonderful Chang-e Hou Yi touching story about Mid-Autumn Festival, a lot of deep cultural connotation of the Chinese puzzles has also inspired a lot of interesting thinkings among smart brains. 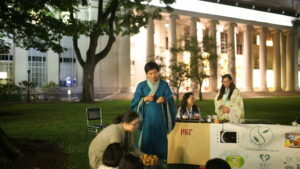 Poetry reading and singing of the most famous Mid-Autumn songs by Dongpo Su of the song dynasty directly push the gathering to the climax.